Today was a good day, we finally bought light bulbs! The lights in our kitchen exploded a month ago, but being a lazy sponge-like creature, I didn’t find it necessary to change them. Because “it’s the most wonderful time of the year” (and by wonderful I mean: -15 degrees, muddy black snow, grannies falling on the frozen pavement, ungodly traffic and angry drivers sending positive vibes to your mother), it gets dark at 17 o’clock, and dark outside, means dark in the kitchen. So, instead of buying light bulbs, I figured we could use a flash light. Been cooking with a flash light for weeks now. I almost feel like Bear Grylls, living in the darkness, trying to fight nature’s severity. Only, I’m not in a forest and I’m using electricity… Oh well. You know, I’ve heard a lot of stories coming from people, who think they’re lazy slobs and procrastinating cockroaches, but I have yet to see someone as lazy and irresponsible, as me and my sis. I think the student dormitory life has taught us that nothing is forever, everything changes. We used to put some effort into leading a normal life, before the dormitory. But when you live in a 7 square meters room, with two other girls, you gradually start believing that whatever you do is pointless and you might as well give up on normality, right from the start. Have you guys ever lived in a dormitory? How was it? Anywho, time for fashion! There’s nothing that can brighten up the gloomy weather, like a little hobo style. I scored this sweater in the men’s section from a second hand store and I’ve been so proud of it! I wanted a creamy white sweater for years, but couldn’t find a decent fit and color. Praise Cthulhu for the men’s section! Styling this was fun! There are so many possibilities. I love oversize sweaters with maxi skirts. As long as proportions are not over the top, I think it looks awesooomee! I've never lived in a dormitory, so can't relate, but it sure sounds interesting! I f* love this outfit… you look like a fairy… adorable!! I've noticed that light shades and winter/snow have been especially popular lately, I mean the combo of those two. and yours looks beautiful. makes me want to try something like that too.. but I would freeze so must wait for spring and then give it a go. when it comes to dorms then thank god I didn't have to live in one. my parents bought an apartment and now my brother lives there. I myself realized I hate apartment life, all those annoying neighbours, the fact that I didn't have a garden, sauna etc. but my friends lived in a dorm and didn't look too happy there either, hehe. С риск да се повторя – искрено ме забавляват постовете ти! Аз пък съм се къпала на тъмно или на свещи доста пъти, поради подобни причини. Влизала съм в общежитията в София и са доста депресиращи поне за мен. I have lived in a dormitory- for 2 months. Then I fleed 😀 I hated it! My flatmate was a nice person but I started to hate her too, I hated her coz she had light brown hair and and wore red leggings. Makes sense right? you nailed this outfit, the sweater is a great find. also, your commentary is hilarious. Хаха, готвила си на фенерче?! 😀 Пуловерът е страхотна находка и с полата изгледжат чудесно. Gosh, I'm amazed that you can pull off a big sweater AND a swishy tulle skirt! Are you a fairy princess, too? You do boho very well – and it's hard to pull off winter boho. When I think of boho, I usually think of carefree surfer girls in California. Oh and don't worry about being lazy with light bulbs. They should be the least of your worries when you're a busy student. Обичам ти очите! Иначе сладък аутфит, и аз имам един такъв бабин пуловер. Anyways, I think when dealing with oversized garments that a monochrome look is a great approach. Love this post! That is a man's sweater?! Sometimes one can find the best items by going out of their normal shopping sections. 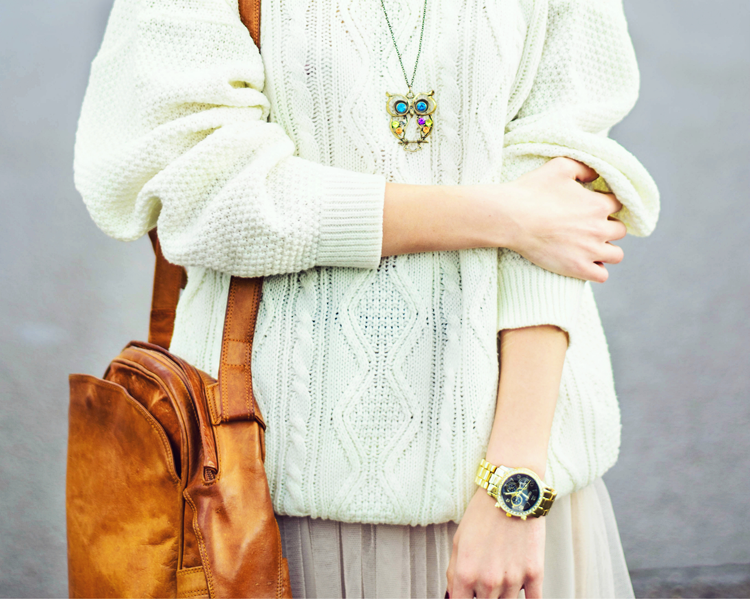 The fit and color are absolutely perfect, as is the knit on the sweater. I love that kind of texture. Oh goodness, dorms do make one lazy. When I was in college I was the laziest slob alive, for sure. The colors and textures in this outfit are so spot on that it's almost painful. Haha. The boots are perfect! Well done! Your skirt is perfection. Keep it up girl – YOU'RE KILLING IT.